The SRWALLBRKT2U SmartRack® 2U Vertical Wall-Mount Rack Bracket is recommended for home offices and small businesses with rack-mount equipment that doesn't need to be secured and no room on the premises for a standard 19-inch server rack. 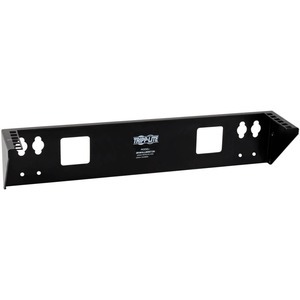 Made from heavy-duty cold-rolled steel with a durable black powder-coated finish, this 2U rack-mount bracket easily attaches to the wall of your back office or closet with user-supplied hardware. 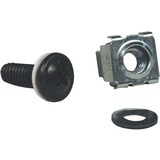 Wall-mounting holes are spaced 16 inches part to match standard wall-stud placement. Or you can install the bracket horizontally beneath a desk or workbench for instant access. Use the included hardware to attach your 2U rack-mount equipment, such as a network switch or UPS system, to the steel bracket's rails. Its maximum load capacity is 175 pounds. Connected equipment hangs flush against the wall, allowing you unrestricted access. The SRWALLBRKT2U is compatible with most EIA-standard 19-inch two-post rack equipment.